The crazy things you spot in Taipei! 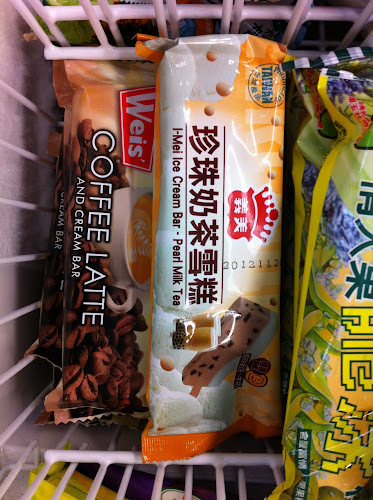 I was tempted to try the pearl milk tea popsicle by I-Mei, but I resisted since the picture of the "pearls" looked more like cubes rather than boba. Frozen boba would taste pretty hard, right? Maybe I'll have to try it next time for "research." LOL. Oh Gosh, now that's a tweat for the humid summer in Taipei! haha. So want to try one!! I wonder how the boba will taste :o When I've made boba and put it in the fridge it gets hard D: Frozen must be like... rocks! it's not bad! the 'boba' have a jello consistency. has anyone tried the pudding popsicle yet? mm, they do look good tho! I love these Taiwanese popsicles. My favorite has to be those pudding ones! It's good, has authentic milk-tea taste. The pearl is very soft, easy to miss when eating so that's different. All in all I liked it, would try again. Wow cool, didn't notice these before.